September has come and all eyes have now turned to the Ukraine and the 62nd edition of the Eurovision Song Contest. Although a decision surrounding the host city is still to be made, that has not stopped artists, management, fans, and media alike from speculating who will be taking the opportunity of representing their countries in Ukraine next May. The rumour mill can be a farfetched place but ESCDaily’s Neil MacInnes decided to look through five of the rumours which may actually be true. Last year it was VRT who took over the duties of Eurovision for Belgium and so this year it is the turn of RTBF; the French broadcaster who brought us Roberto Bellarosa in 2013 and Loic Nottet in 2015. Both of these artists had previously participated in The Voice Belgique which has led people into believing that the broadcaster will continue in the same fashion and internally select an artist who has been associated with the show for Eurovision 2017. Two big names which had been put forward were Pierre Lizee and Olivier Kaye. Belgian magazine Telepro reported that songs were currently in the works for both artists and a decision will be made before the end of 2016. The magazine also hinted that due to the success of Loic Nottet in 2015 with the alternative sounding “Rhythm Inside” it would be much more likely that RTBF will choose Pierre Lizee, as his style is more similar to that which has proven to be a success. The UK is always rife with rumours about who will do Eurovision and very rarely are they ever directly addressed by artists or management. 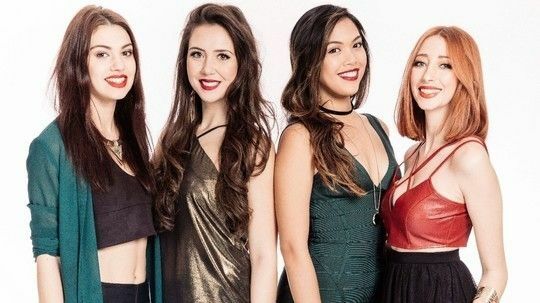 However, recently a tweet was sent out by Dean Midas Maynard: a British music PR agent responsible for the four piece girl band Zyrah Rose, more commonly known as Zyrah. The tweet seriously suggested the girls would be heading for Eurovision in 2017. The girls then endorsed the tweet by retweeting to their followers and favouriting other tweets relating to their participation in Eurovision 2017. They’ve also teased fans on social media by posting photos in the studio working on new material. Zyrah Rose are best known for competing in Britain’s Got Talent in 2016 where their operatic style saw them through to the semi finals. They’ve also appeared on the soundtracks to Assasin’s Creed and even Game of Thrones. It’s still unknown as to whether the BBC will stick with the national final format for next year or whether there will be an internal selection, however there’s definitely fire behind this one. Although this does seem like a far stretch, the star has been trying to achieve the levels of break out success she held in the mid 2000’s and Eurovision has been cited as a serious platform for her. The decision really rests with RTP, as they do the annual Festival da Canção, which Nelly Furtado would have to compete in in order to gain the chance to represent Portugal at Eurovision. However the broadcaster could take an entirely different approach for 2017, making an exception to internally select one of their biggest stars. We already know that SBS has the ability to pull in big names for Eurovision, we already know that it will likely be an internal selection for Australia this year so naturally the speculation is there. Delta Goodrem recently decided to leave her role as a judge on The Voice Australia in order to focus more on her career as a musician. It was also revealed recently that her management cancelled a stadium tour around Australia as they deemed that she would be unable to garner sufficient ticket sales. This coupled with the fact she cowrote the Junior Eurovision entry for Australia in 2015 puts her front of the queue for an Australian Eurovision entry. It is well known that many artists featured at Eurovision like to collaborate and a recent instagram post set fans alight with the knowledge that two artists from previous Eurovision fame will be working together on an entry for 2017. Mahan Moin, who participated in Melodifestivalen 2014 with the song “Aleo” was recently pictured in a recording studio working with Stig Rasta, who represented Estonia in 2015 with the song “Goodbye to Yesterday” and who also wrote the 2016 Estonian entry “Play” by Juri Pootsmann. It would seem normal on any other day, however they used the hashtag #esc2017 which strongly suggests they are working on new music for Eurovision. Whether this will be a Melodifestivalen entry or an Eesti Laul entry, or maybe even for another selection, we are not sure, but there is definitely fire behind this smoke.